Come one, come all! Choose among our booth and activity suggestions to organize a fun carnival day or week for your group. Print our perpetual calendar to announce your carnival day along with a carnival book for each child. (Open thematic poster-Carnival) Print, laminate, and decorate the walls of your daycare with all kinds of posters. Organize a special carnival day for your group. (Open perpetual calendar-Carnival Day) Print and display. Set up several booths. Display a poster at each booth (Open carnival posters) so that children know which activity is offered. Hang colourful decorations (balloons, garlands, streamers, etc.). Play music, offer treats, and serve cake. An early childhood educator can be present at each booth to present the various activities.You may choose to set each booth up in a different room. Give each child a carnival book (Open carnival book). Children can add a stamp each time they visit a booth. You may decide that they can visit each booth a maximum of three times. If you wish, you can invite parents to take part in this carnival day. You can set up the booths for one special carnival day (parents can participate) or organize a carnival week and offer a few booths each day. Choose a corner for each booth. Display a poster at each booth (Open carnival posters) so that children will know which activity is offered. Play music, offer treats, and serve cake. Depending on the number of children in your group, you may want to organize a carnival day along with another daycare. This will lighten your load since you will not have to plan everything alone and children will have lots of fun, the more the merrier! Print a carnival book for each child (Open carnival book). Children can add a stamp each time they visit a booth. You may decide that they can visit each booth a maximum of three times. Use hula hoops to draw a path on the floor for participants. At the start, children must place a ball between their legs. They must hop in each hula hoop and then hop back to the starting line and give the ball to the next player. Determine a start and finish line. Place a bowl filled with frozen peas and a spoon at the start line. At the finish line, deposit an empty bowl. Participants must pick up one green pea with the spoon and carry it to the other bowl without dropping it. At the finish line, they drop the pea in the other bowl. You may decide to give each child 2 minutes during which they can go back and forth between the bowls as many times as possible. When the time is up, count how many peas each child was able to transfer to the second bowl. Set up a magnetic dart game. Participants must throw the darts onto the dartboard, trying to hit as close to the centre as possible. Determine a start and finish line. At one end, deposit a bucket of water and sponges. At the other end, deposit an empty bucket. Draw a black line on the empty bucket to indicate the water level that must be reached. Participants must wet the sponges and then wring them out in order to fill the bucket which was initially empty up to the black line. Time each child. Inflate several balloons ahead of time. Tie a piece of ribbon to each balloon and use this ribbon to tie a balloon around each player's ankle. Outline a playing area with electrical tape. Two players at time, participants try to pop the other child's balloon with their foot. Weather permitting, fill tiny balloons with water and store them in a container. Two players stand face to face, a certain distance from each other. One player throws a balloon to the other child. If the child catches the balloon and it doesn't pop, each child takes a step back and the game continues until the balloon pops. Two participants are required. They stand next to each other. Tie one child's left leg to the other child's right leg (legs that are touching when side by side). Predetermine a course children must complete before turning around and making it back to the start line. Time each team. Outline a playing area using electrical tape. Two players stand within this area. Each child tucks the tip of a scarf in the back of his/her pants. Start a timer. Participants must try to steal the other child's scarf before the time is up. Fill a plastic dish tub with water. Drop a few apples (or just one) in the water. They will float on the surface. With their hands behind their back, participants must try to catch an apple using only their mouth. Smarties are peanut-free candy. Drop 25 to 30 candy pieces in a container filled with flour. Participants must try to find all the candy pieces. Provide non-toxic face paints and mirrors. Participants will enjoy painting their face. Make several copies of the list of items children must find (Open treasure hunt game). 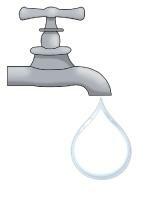 (Open game faucet-Water games) Print, laminate, and display the faucet on the wall. Give each child a laminated drop of water. Participants take turns attempting to stick their drop of water as close to the correct spot as possible while blindfolded. Have children crawl under chairs, slither under coffee tables or under a rope hung between two chairs, jump over exercise balls (leapfrog), etc. Use electrical tape to draw a start and finish line. Each child chooses a partner. One child from each team plays the role of the wheelbarrow and places his hands on the floor. His partner lifts his legs, holding him by the knees. When you give the signal, everyone moves towards the finish line as quickly as possible. The first team to reach the finish line wins. Hang a long clothesline between two chairs. Divide your group into two teams and give each team a bag containing clothespins. When you give them the signal, children attach as many clothespins to the clothesline as possible. If you wish, you can play a song and children try to add as many clothespins as possible before the song ends. Count how many clothespins each team added to the clothesline. You can identify the clothespins using a different colour marker for each team. 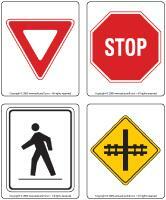 (Open traffic lights and signs) Print and laminate. This is a very simple game. When you display the red light, children must stand still. If you display the yellow light, children can walk slowly. When you show them the green light, they may run. 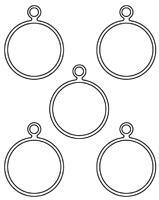 (Open black and white medals) Print. Encourage each child to decorate his/her own participation medal. Provide pieces of yarn, crayons, stamps, etc. Their medal will represent a souvenir of their carnival day. Organize an obstacle course for your group. 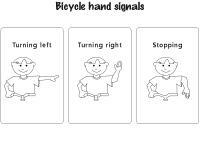 Teach children the three main hand signals used by cyclists. (Open bicycle safety) Print and laminate. Have children turn right or left or come to a stop by displaying the signs. Fill a basket with water balloons. Divide your group into two teams. Determine a start and finish line. Set one basket per team on the finish line. The object of the game is for children to successfully transport as many balloons as possible to the finish line and drop them in their team's basket without popping them. If you wish, you can play music and end the activity when the song ends. Give each child a teaspoon and a golf ball. The object of the game is to walk as quickly as possible towards the finish line, without dropping the golf ball (the "egg"). If a child drops the "egg", he/she must go back to the start line and start over from there. Sit in a circle with your group. Children pass a potato around the circle to the sound of fast-paced music. When the music stops, the child holding the potato must go to the centre of the circle and so on. Make your own bean bags by filling Ziploc bags with rice or beans. Slip the plastic bags in socks. Set up an obstacle course. Children must transport their bean bag without using their hands: on their head, between their legs, under their arm, under their chin, etc. 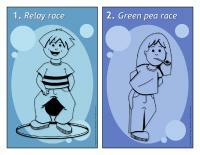 Each child must select one method to transport his/her bean bag and use it throughout the course. If a child drops his/her bean bag, he must reposition it before continuing. Determine a start and finish line. Give each player a pillowcase. Participants stand in their pillowcase on the start line. The object of the game is to be the first to hop over the finish line. Divide your group into two teams. Set two baskets on the floor. The object of the game is for children to throw as many tennis balls into their team's basket before the time is up. Deposit a few empty baskets or containers on their side. The object of the game is to roll the golf balls as close to the baskets and containers as possible. Give each child five golf balls. Have children perform long jumps in sand or snow. Set mats on the floor and invite children to perform somersaults followed by original poses.